This entry was posted in Vacuum Tubes and tagged Brimar by tubemaze. Bookmark the permalink. Very cool looking rectifier tube. 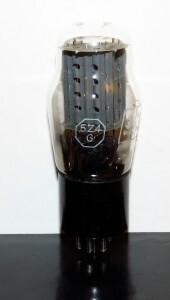 This tube is low voltage drop of 5Y3G tube. If 5Y3 drops voltage by huge 60 volts, this beauty drops voltage only by 20 volts. Other than that, other specs are very similar 125 mA and 350 vots Max. This makes it usable in many systems. This tube is like 5ar4 vs 5u4 compared to 5y3. So if your amp takes 5Y3, this is the tube to get. Sound wise, this tube is superb. Great bass and transparency. HIGHLY RECOMMENDED.